More than 400 addresses across Scotland have been identified as potential "no-go areas" for ambulance staff. Figures obtained by the Scottish Conservatives show 437 properties were deemed too dangerous for staff to enter without police protection. The addresses were identified after staff reported previous negative experiences where workers had been threatened or attacked. Greater Glasgow and Clyde recorded the highest number of no-go sites at 125. A spokesman for the Scottish Ambulance Service said the safety of ambulance staff was paramount and the service had a number of measures in place to protect crews. He said: "If any ambulance crews feel that their safety may be compromised, they are instructed to hold nearby the scene and await support from the police, or additional ambulance crews. "As a further protective measure, addresses where there have been previous incidents of violence or threatening behaviour towards staff, are flagged in control rooms. This means that if a 999 call comes in from a flagged address, dispatch staff can request additional police support." Conservative justice spokesman David McLetchie said it was "hypocritical" of the SNP to boast about crime levels in Scotland reaching a 32-year low when there were more than 400 places across the country where ambulance workers could not operate without protection. He said: "People who threaten, or worse, attack emergency staff should be dealt with in the severest possible way. "The Scottish government must act on this immediately for the benefit of the wider public and the workers themselves. "At a time when budgets are pressed, we cannot afford to have ambulances waiting outside addresses because the occupants are too violent to deal with." Greater Glasgow and Clyde recorded the most red flagged addresses at 125, followed by Lothian with 86. However, as Scotland's most populous areas, their red flags represented one flagged address per 10,000 people each. Fife and Forth Valley were third and fourth place, with 53 addresses each, but topped the table per head of population at about one red flag for every 6,000 to 7,000 people. 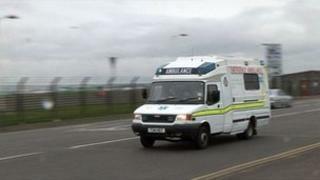 The Scottish government said it took the issue of violence against ambulance staff seriously. A spokeswoman said: "Violence against NHS staff is clearly unacceptable but this represents a very small proportion of the around 2.5 million residences across Scotland. "We take the safety of our NHS staff very seriously, that is why they have the support of their police colleagues and are also covered by the Emergency Workers Act which provides legal protection." Labour's spokeswoman for health Jackie Baillie described the figures as "deeply depressing". She said: "Scottish Labour toughened the law to crack down on the mindless minority who attack our emergency workers and they should expect to face the full force of the law. "The SNP government must ensure the message is being sent loud and clear that if you assault any ambulance worker you should expect to be severely punished."